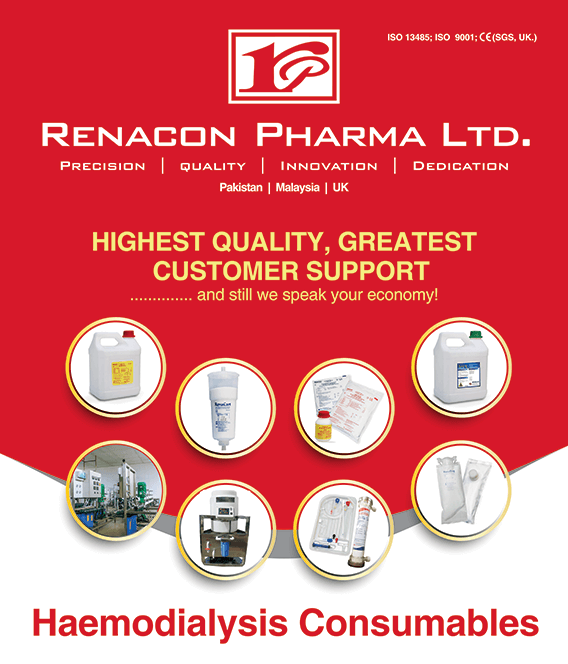 Company Profile | Renacon Pharma Ltd.
Renacon Pharma is the pioneer manufacturer of all types of highest quality Hemodialysis Concentrates in solution & powder forms in Pakistan with since 1996 with ISO 9001:2015; ISO 13485:2016, CE 0120 (SGS,UK) & cGMP certification. It also manufactures various types of haemodialysis disinfectants, automixers, RO plants, salt tablets for water softeners, neutraceuticals. It also supplies diayzers, bloodlines and AVF needles. Renacon Pharma Ltd. is a member company of Treet Group of Companies, one of the biggest industrial groups in Pakistan. In third world countries about 90% new patients of end-stage-renal-disease die within the first year due to poverty, ignorance, non-availability and non-affordability of dialysis treatment. Many of the available haemodialysis facilities offer poor quality treatment adding to the misery of patients and families. Hence there is a dire need of low-cost and good quality hemodialysis facilities. In late 90’s, Acetate Hemodialysis Concentrate solutions have been provided by Renacon Pharma at about 40% lower cost as compared to similar brands available in the country while Bicarbonate Hemodialysis Concentrate solution was introduced at 1/3rd of the cost of imported similar products. By virtue of introduction of low-cost, high-quality Bicarbonate Hemodialysis Concentrate there has been a break-through and now about 100% of kidney-failure patients are getting Bicarbonate dialysis with a much superior quality of life. Renapulv, the powder form of Bicarbonate Hemodialysis Concentrate, has significantly less volume, weight, freight, breakage & price as compared to solution form and is the preferred form for export to other countries which has further cut down the cost of dialysis for the miserable and non-affording end-stage kidney-failure patients. Good quality fully automated mixers for dissolving powder (Renapulv) are available for Hemodialysis Centres. Renacart, Bicarbonate Cartridge and bibags (RenaBag) are also manufactured. Renacon Pharma is also producing custom-formulations of hemodialysis concentrates as per customers’ requirements with labeling in any language of choice. In Renacon Pharma, research & development section is very efficient and is always making hectic efforts to provide low-cost products including packing without compromising on quality for the betterment of huge population suffering from kidney disease. Renacon Pharma is exporting its hemodialysis products to multiple countries across the globe including Nepal, Vietnam, Jamaica, Sri Lanka, Malaysia, Kenya, Zimbabwe, Philippines, Madagascar, Afghanistan and neighboring states, etc, while export communication/registration of product is being carried out with lot more countries. Renacon’s new state-of-the–art plant is under construction at 10 acres land in the most modern industrial estate near Lahore and will be operational before the end of 2019 to cater for needs of EU and Americas while the present facility is already catering to the needs of multiple countries. Renacon Pharma Sdn.Bhd. is also likely to be starting production in a new plant in Malaysia within 2019.